As explained in our assembly instructions you can clean your Ecoease panels with water and a damp microfiber cloth. 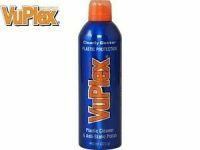 VuPlex® plastic cleaner & anti-static polish goes a step further as it cleans and protects your sheets and is ideal for removing static build up if you remove the protective film from the sheets too quickly! It is non-abrasive so it will not scratch and will add a fine layer of protection to the surface. It also helps to repel further dust on an ongoing basis. Excellent for cleaning Ecoease panels (it is the only plastic cleaner that we use in our factory) it is also suitable for a multitude of cleaning applications around the home. Perfect for computer and TV screens. We use it on our mobile phone screens and our glasses! Only use with dry microfibre cloths.